The World's Fair of 1893 in Chicago was a spectacular international exhibition that showcased many great achievements in science, technology, culture, and entertainment. Acting as organizers of the fair, players work diligently to increase their influence throughout the fair and obtain the grand exhibits that will be put on display. The organizer who has earned the best reputation when the fair begins will emerge the victor! 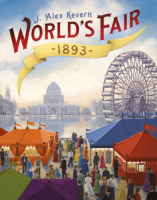 Add a Review for "World’s Fair 1893"